Come September and the Bengaluru city will be gripped by the frenzy of one of the biggest annual international business summit of the country. From its inception a decade ago, Vista, IIM Bangalore's annual international business summit, has been ever growing in size, style and substance and Vista 2014, to be held from 26th to 28th September 2014 promises to be the best till date. Vista 2014's theme is A Step Ahead. Vista 2014 strives to perpetuate this notion of being in the forefront of in every realm, be it business, politics, social issues etc., and believe that it shall pave the way to the next milestone in human ingenuity. 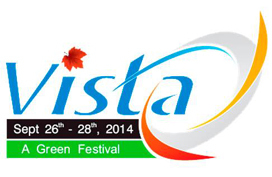 The heart of Vista 2014 lies with its highly competitive event line-up. Competitions like Numero Uno, Brigade Trojan Horse, Street Smart, BzzWings etc. have received tremendous response which shows the approval of the business community towards the finesse of these events. A plethora of on-the-spot events are scheduled to be held over the three days with exciting prizes to be won, and attend other fun events such as a standup comedy show by Kannan Gill. Vista '14 will also see the inception not one but two brand new workshops, aimed at giving the young student community of the country a flavour of management education. Young Leadership Program (YLS) is a unique 3-day program designed to provide a holistic experience of exploring and learning valuable fundamentals of management, leadership and innovation by none other than IIM Bangalore's own globally renowned faculty. Entrepreneurship Conclave, which is being organised in association with NSRCEL, endeavors to bring entrepreneurs and investors at the same platform and facilitate significant networking, dialog and communication between the two. We will play host to an impressive line of speakers and the countdown already began when former caption of New Zealand's national cricket team, Stephen Fleming came down to the campus and gave a very enlivening talk on Leadership and Management Lessons from the world of Cricket. We have already confirmed Dr. Subramanian Swamy and Ronnie Screwvala and are in the process of bringing few more exemplary personalities on board for the same. We will also have one of the India's most famous ad man Prahlad Kakkar, who will be conducting an Advertising and Branding Workshop in the campus on 27th September 2014. The countdown to Vista 2014 has already begun, with a promise of a better and bigger celebration of business acumen all over the world. Be there at IIM Bangalore campus from 26th to 28th September 2014 to witness and be a part of the carnival.